All files posted here are strictly Freeware & subject to the usual conditions. Please respect our wishes NOT to redistribute the files (in whole or in part) or upload them to other sites. This will enable us to support it properly & avoid piracy. Fly the MiG-15bis as a Soviet PVO pilot operating from bases in Manchuria just north of the Yalu River in 1950-51. You will face opponents such as the B-29, B-26B, F-80, F-82, F-84, F-86, F-51D, F4U, AD2, T-6 and more. Features La-11, Yak-9, Tu-2 and Li2T AIs and the new CVE118 USS Sicily. Carrier based campaign commemorating the much overlooked contribution of Commonwealth forces to the Korean conflict. Features the Hawker Sea Fury - the ultimate piston engined fighter - operating from HMS Ocean. The campaign is inspired by THE HUNTERS, a novel by James Salter: "... and they had followed all the way, firing as they did, with that contagious passion peculiar to hunters." From the amount of feedback we've received so far, both existing campaigns are still very popular with few problems. The bugs that were reported were soon fixed with the patches posted here. We don't have time to visit all the CFS2 forums so if you do have a problem please contact one of us direct from the Contacts page. Please visit the new Extras section from the menu at the bottom of this page. This is where we intend posting various files created by individual members of the team. 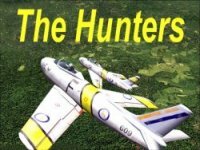 Mike Eustace has developed a new panel for any F-86 Sabre including the Player aircraft in the Hunters campaign. Collin Glendinning & Pat Sullivan, our nautical advisers, have created some fine new ships for use in future campaigns. These will be of interest to anyone wishing to create their own missions & can be downloaded separately from CG's Shipyard and Sully's Ships (links at bottom of page). I intend updating this main page as time allows. Existing campaigns can be downloaded by clicking on the images above.